In a medium bowl, mix together soy sauce, honey, ketchup, garlic, basil, sriracha and red pepper flakes. Pour mixture over chicken. Cook on LOW for 4-5 hours, checking for doneness at 4 hours. Serve chicken over rice and use remaining sauce to garnish. Top with green onions if desired. Easy chicken dinners are our favorite kinds of meals. Pair an easy chicken dinner with a slow cooker to make it even easier, and you’ve got us hooked. This spicy slow-cooker chicken has everything you could want in a weeknight dinner: simple, affordable and delicious. While chicken breasts are usually a popular choice, but using budget-friendly chicken thighs instead adds a lot of extra flavor. Unlike breast meat, the fat in the dark meat is what keeps the meat moist and tender. And while chicken thighs are tasty enough alone, it’s the sauce in this recipe that really makes this dish sing. Using ketchup and honey add sweetness, while the soy sauce adds that craveworthy hint of salt. If you like a little spice, don’t be afraid to go all in on sriracha and red pepper flakes. 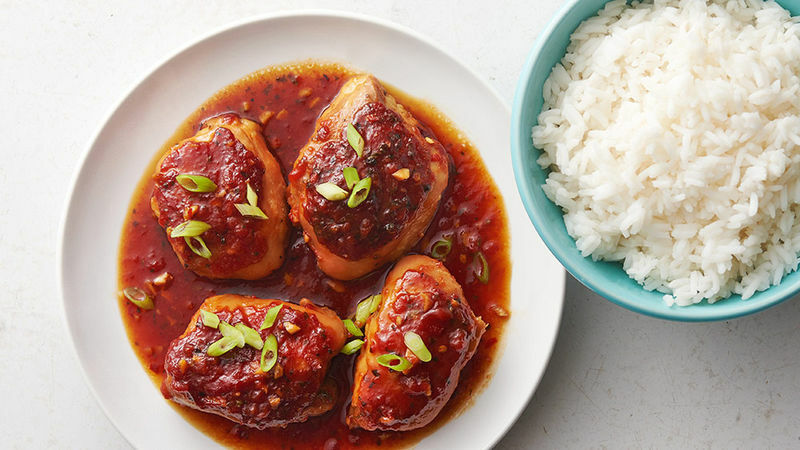 Serve this crockpot honey-garlic chicken with rice for a complete and wholesome dinner.